Yesterday I had a heap or should I say a mound of blueberry pikelets for breakfast, drizzled with a river of honey and almost all the fruits in season, on the side. (it was a medley of nectarines, pears, apricots, peaches, plums, strawberries and cherries). I just felt like giving myself a treat. Don’t you sometimes feel like spoiling yourself? I wonder what the weather was like wherever you were. My air conditioner was on full blast so you can guess what the weather was like here. Today we had a very pleasant weather, all the windows and doors were open and we enjoyed a cool breeze and soft sunshine throughout the day. And guess what? I’m still going to the Laundromat. I never got round to buying a new washer. I go once every fortnight. It takes me two hours to do four huge loads of washing and drying. It has really simplified my life. I wonder weather I will ever buy another washer. Maybe during winter it will be so cold, I’ll have no choice but to buy one. Lets wait and see. The Laundromat is probably more interesting in winter because the dryers are on and the room is very warm and cosy. 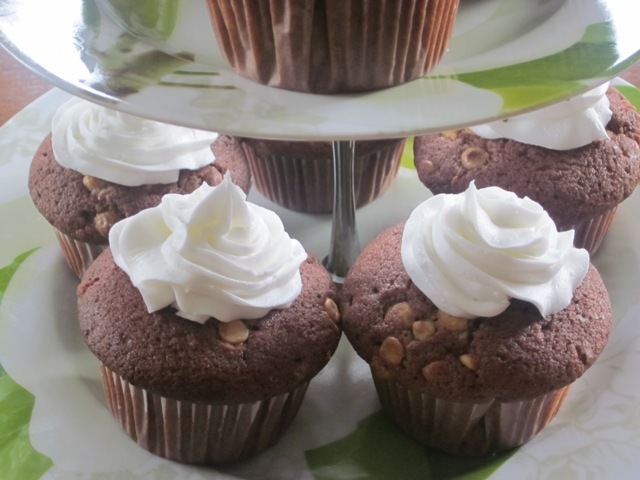 Today I want to share with you a recipe for double chocolate cupcakes, with honey. They have my favourite ingredient, white chocolate. 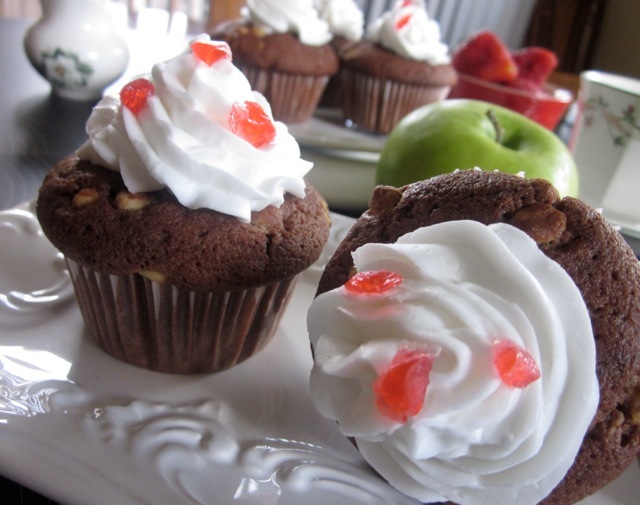 I really enjoyed eating these cupcakes and I hope you do too! Combine the water, sugar and honey in a pan, stir over heat without boiling until sugar is dissolved. Bring to boil and remove from heat. cool the syrup to room temperature. and beat until light and fluffy. 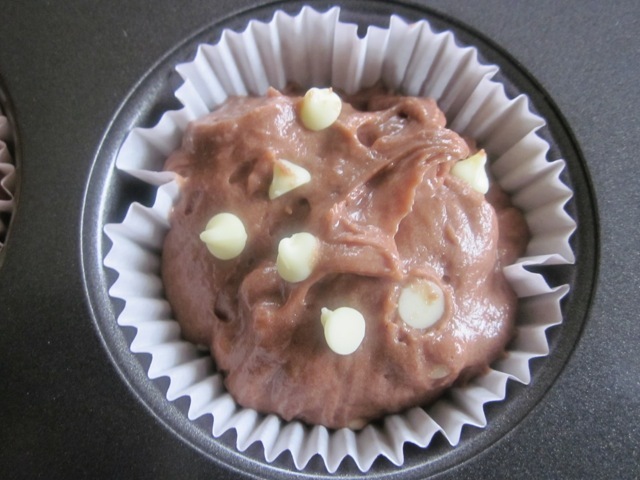 Stir in sifted flour and chocolate chips all at once. 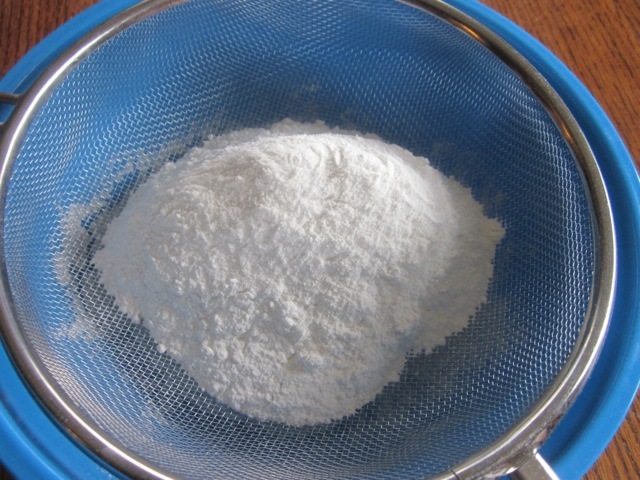 Beat egg whites until soft peaks form, fold half the egg whites into the mixture, then fold remaining egg whites gently into the mixture. Stand a few minutes before turning onto wire rack to cool. I didn’t use the honey icing. I had a lot of butter icing left over from previous baking which I used to ice the cupcakes. We enjoyed eating the cupcakes! Preheat the oven to 400°F (200°C) ten minutes before using. 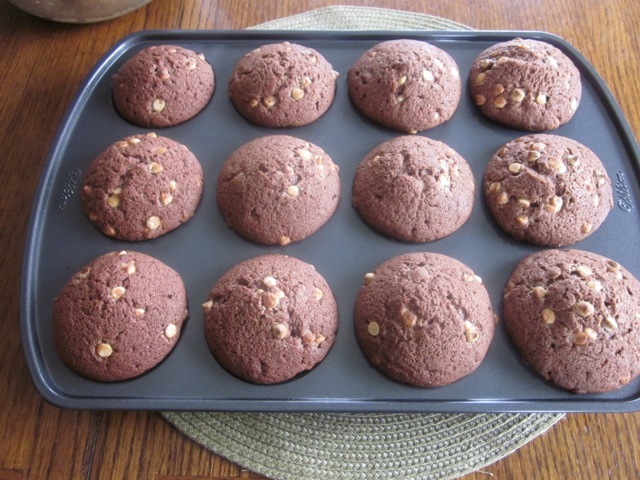 Line 2 medium muffin pans with 14 paper cups. 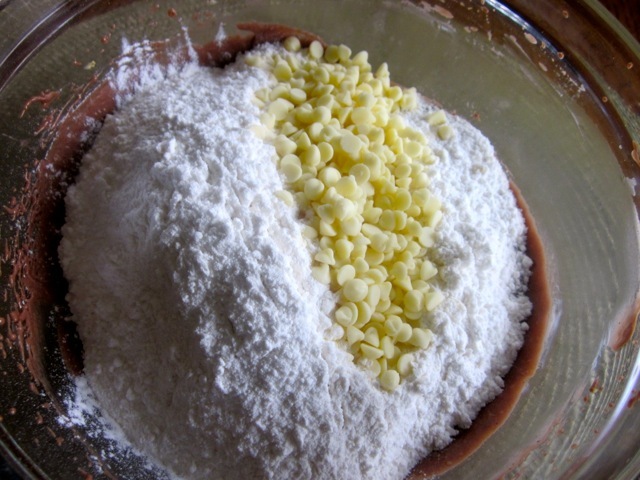 Sift the flour and baking powder and set aside. Combine the water, sugar and honey in a pan, stir over heat without boiling until sugar is dissolved. 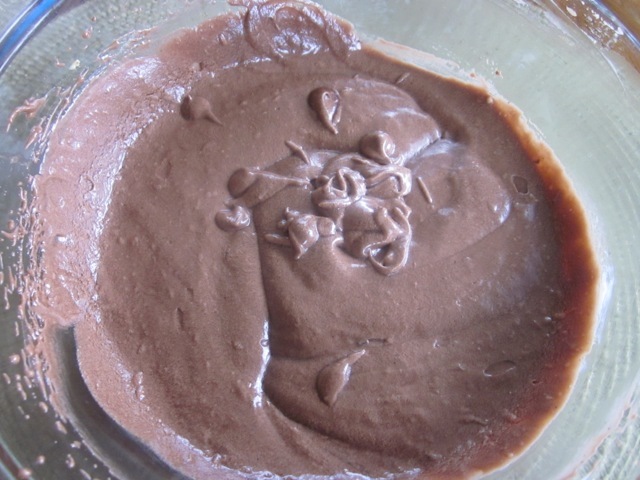 Bring to boil, remove from heat, add cocoa powder, stir to combine then cool syrup to room temperature. 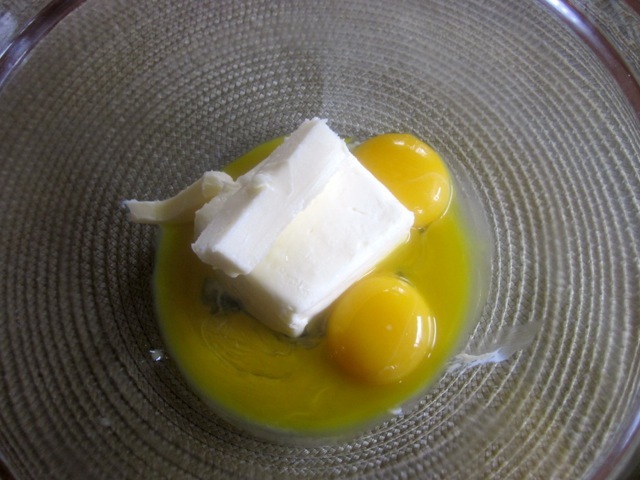 Beat the butter, vanilla and egg yolks together until light and fluffy. 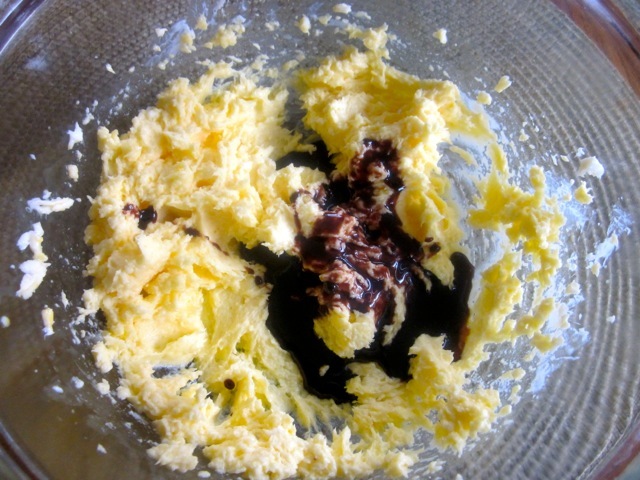 With mixture on medium speed, gradually pour in syrup in a thin stream and continue beating until all the syrup is mixed in. 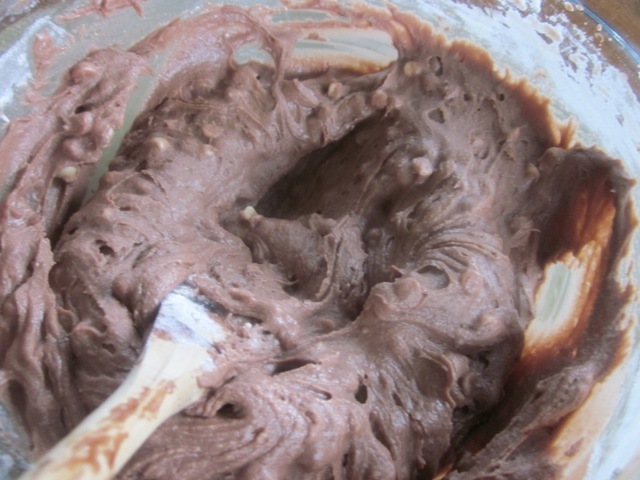 Stir in the sifted flour and chocolate chips all at once. 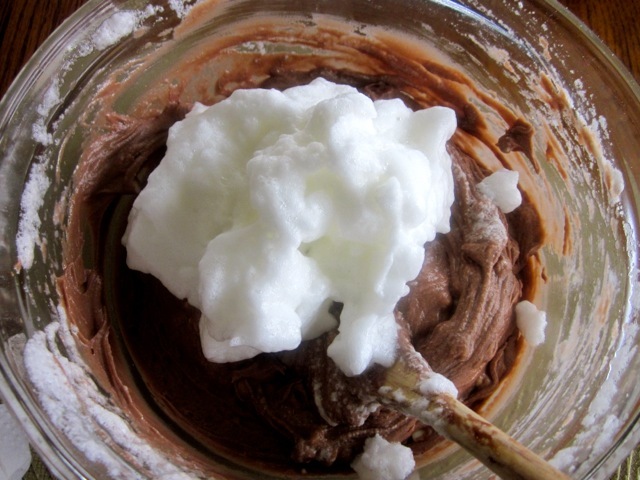 Beat the egg whites until soft peaks form, fold half the egg whites into the mixture, then fold remaining egg whites gently into the mixture. 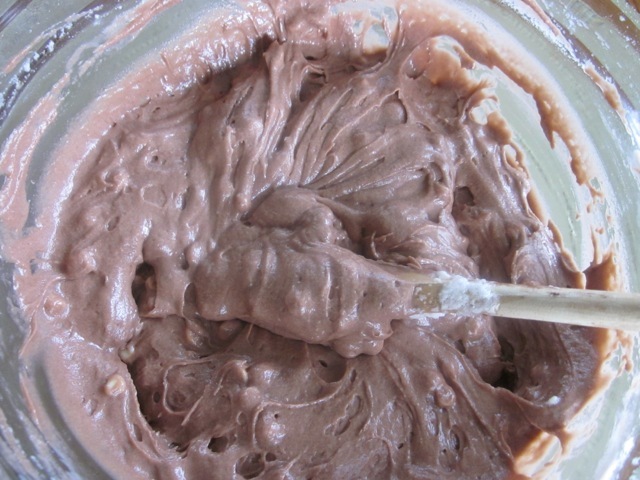 Spoon the mixture evenly into the 14 paper cases. Bake at 400°F (200°C) for about 20-25 minutes or until a toothpick inserted in the middle comes out clean. Stand a few minutes before turning onto wire rack to cool. 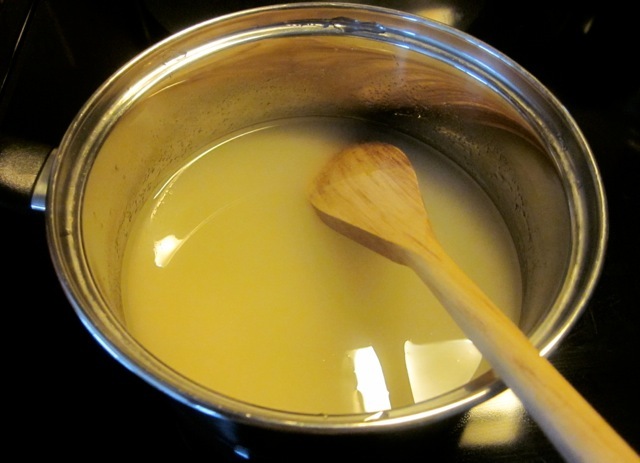 Honey cream: combine water, sugar and honey in a saucepan. 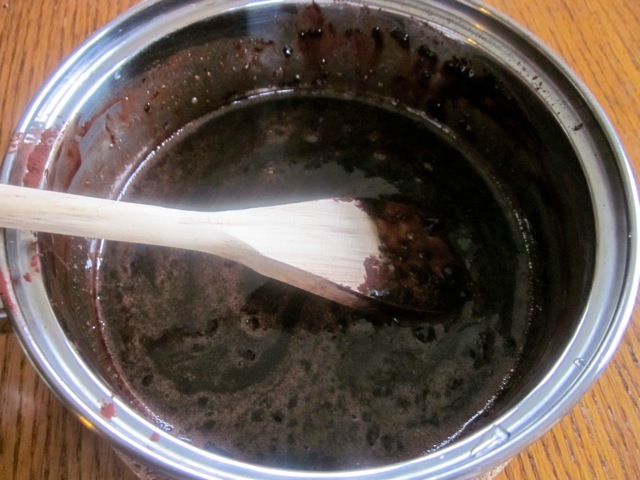 Stir constantly over heat without boiling until sugar is dissolved. Bring to the boil and remove from heat. Cool to room temperature. 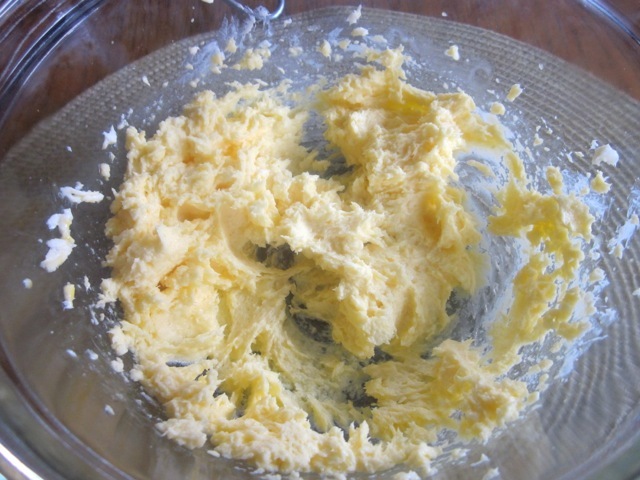 Beat butter with an electric mixer until light and fluffy. 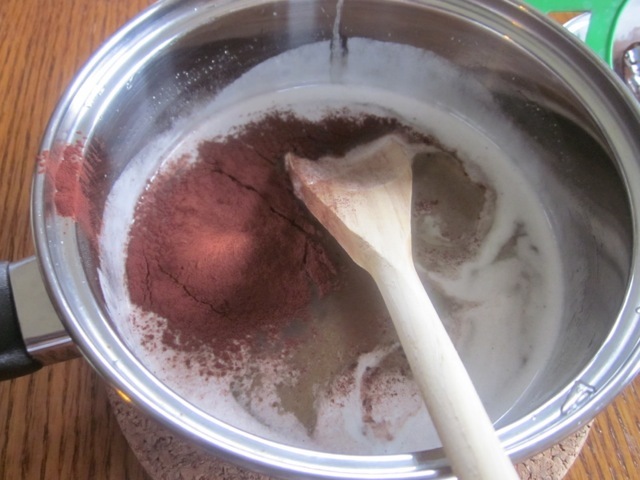 Gradually pour in syrup, beating well after each addition. Please note that oven temperatures are given as a guideline only. You may need to add or reduce the suggested temperature depending on your oven. 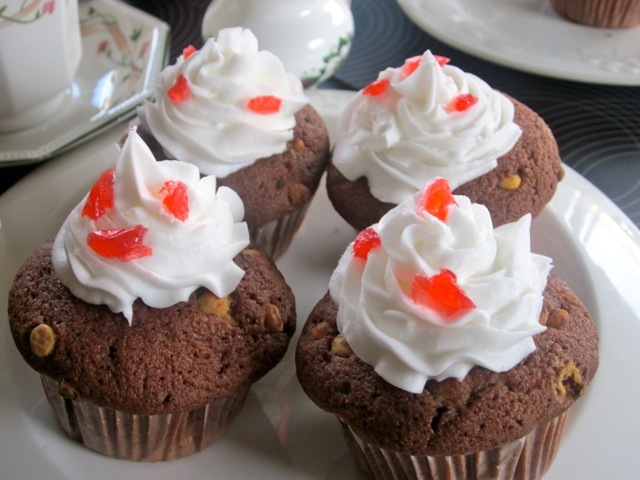 I baked the cup cakes at 400°F (200°C) for 22 minutes. They look lovely and fluffy which is important in my books! I love lovely and fluffy too, that makes the two of us. Thanks for deeming it fit for your books. Wish you a happy day! Very yummy. Thanks and have a lovely week!!! Going to the laundromat was once a favourite pastime of ours! (Maybe not quite as much as cooking though). We used to dump our clothes then go to value village, then the grocery store, and then just chill out and catch up on with each other…. Anyways, with loads of diapers for us we prefer having a washer in our home these days, but once upon a time we too had good times at the laundromat. And yes to the loads of seasonal fruit! It’s been so great for the last month around these parts, fruit is being put on top of (almost) everything we eat! 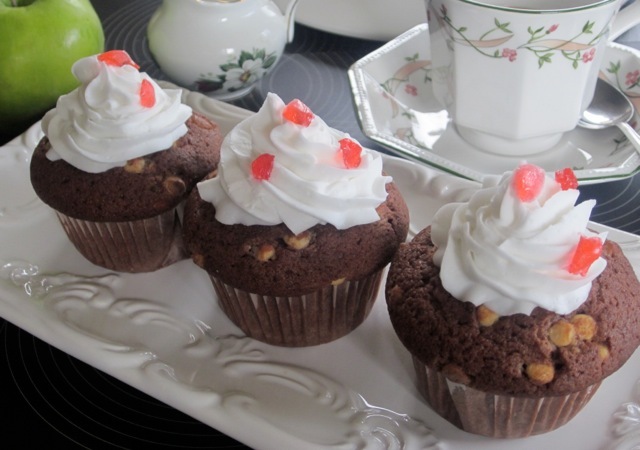 Back to the point of this post, these cupcakes look very nice, I pretty much never make cupcakes but lately I’ve been thinking I need to do more non-yeast baking, so this will inspire me. Thanks, Liz! What a lovely surprise after such a long spell of silence. When I see your photo, the first thing that comes to my mind is some nice healthy pizza with great vegetarian toppings on top. Some of your recipes are etched in my mind because they are always so unique. I know what you mean about diapers, when the 14 and 12 year old were younger I used to have two loads of washing everyday-they were like twins and there was no way one could ever make so many frequent trips to the laundromat. Now they are the ones helping me fold clothes once we are done with the washing. We have a lot of fun and that what matters!!! I have been eating lots of fruits too. It’s so nice to be able to select what to eat. It’s opposite for me, I need to do more yeast baking so perhaps your blog should be the first stop. Thanks so much for the “re-surface” and wish you all the best of times during summer. Hope you are having a great time with your family! 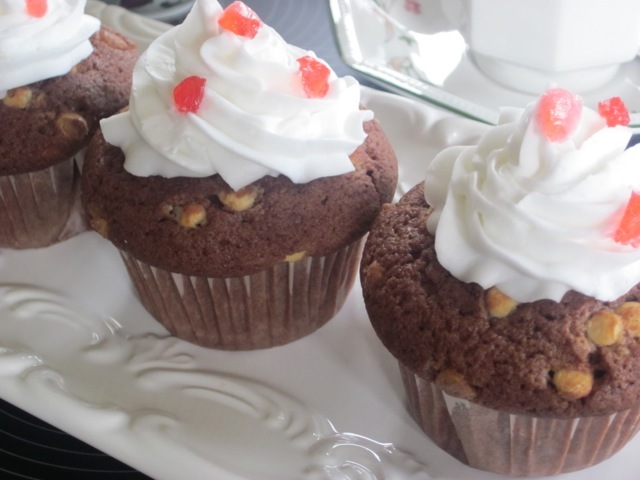 What do you think if I replace the white choco-chips with corns? Is it a good idea? That’s a very interesting question. Never thought of adding corn to a chocolate mix. I tell you what? it doesn’t hurt to try, try it and taste it. Your question will be answered much faster. Please give me a feedback. Thanks for popping by! I must say you have the most interesting life I ever heard of. Now you talk of a herbal week? very interesting. 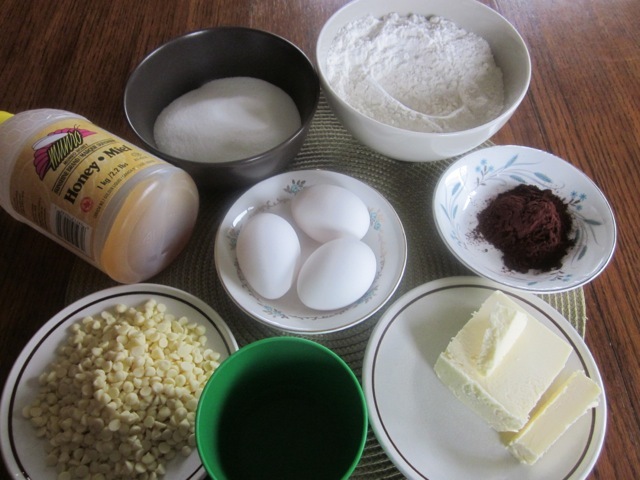 Could you please post some of those ancient recipes on your blog? I would love to see them. 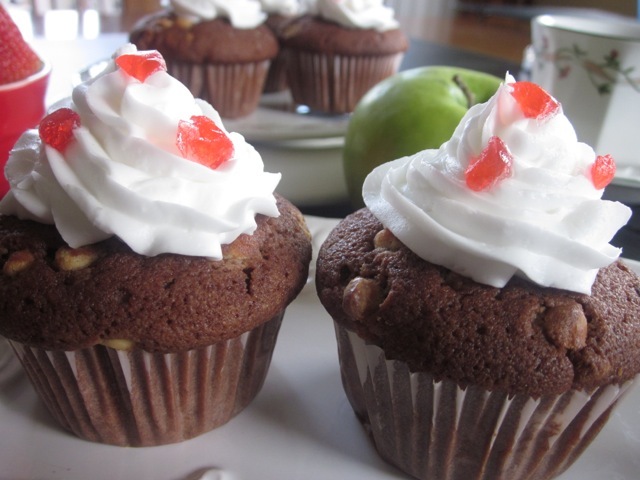 Enjoy the cupcakes if you try the recipe and thanks so much for being such a good networker. I wish you a happy evening. I know it’s now evening over there. Best wishes!!! Have a wonderful weekend! (It’s Saturday now, in Indonesia). Omg we are still enjoying Friday. In fact I just want to have my lunch right now. Don’t worry, just take your time and post them whenever you can. Have a fantastic weekend. I can imagine weekends in Indonesia. They must be very interesting. Thanks Hari! Thanks, Hari, my lunch was delicious. I have just finished!!! (Pasta with spicy butter beans with some cream). My daughter cooked it!!! Now those cupcakes look really yummy! I don’t know how you get that cute little swirl of icing to stand up like that. 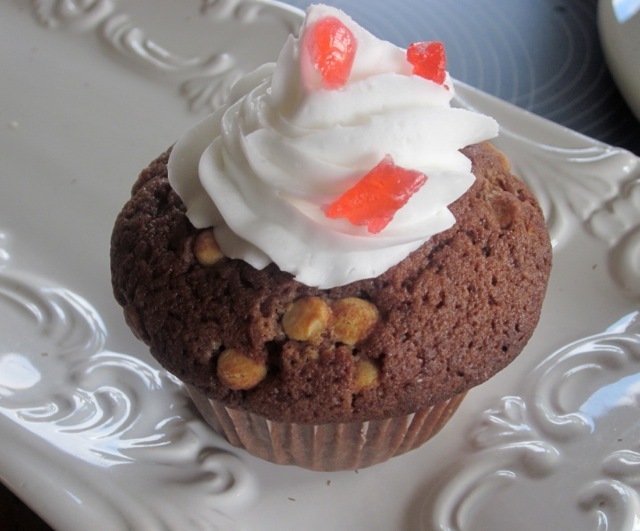 My cupcakes never – ever look poufy and rise up like that. Must be some secret little trick you use? I hope you get a new washer soon. It’s tough having to lug your clothes to a Laundromat! It’s really been quite hot here too and I’ve not been using my oven, never mind turning the washer and dryer on. We have to use a dryer, clotheslines are not permitted where I live. Kind of sad isn’t it? Once the heat reduces I may try your recipe and see what my results turn out like, maybe they will look as good. I’m not holding my breath on that one! Hope you are having a lovely summer Liz. Ha ha I’m always so happy to see you, the moment I see your smile I start laughing. I bought that butter icing from the Bulk Barn. I think it’s cheaper to buy just the right amount you need to use instead of trying to make your own. I find it works our cheaper and also am terribly lazy sometimes. I just put it in an icing bag with nozzle and pressed really hard to get a huge swirl out. Once upon a time, I used to make wedding cakes but stopped when I had my third and fourth babies, they were only 18 months apart, I had an 8-5 job and I just couldn’t cope with it anymore. Now they are 14 and 12 years old, maybe one day I shall start cake decorating again, but I think I sort of lost the interest. I am not too motivated about it anymore. About the Laundromat, I’m actually enjoying going there, it takes a much shorter time to wash. It used to take me a full day at home, now I do it once a fortnight and it takes only two hours. I have gotten hooked to the laundromat…sounds funny, doesn’t it? We are also not allowed to use clotheslines here, so don’t worry, we are sailing in the same boat. Talk about trying recipes did you finally buy the weighing scale? the last time you went to Canadian Tire you bought chairs instead. I was so tickled. l laughed at you for days on end!!! I am having a whale of a time, and right now I’m in the Library. I don’t seem to get anything done at home so I have to spend a few hours in the library to get anything done. I am in the summer mood…right now. Thanks Sandy, for your friendship. You are a very special lady. I hope one day I shall meet you. Have a lovely week and remember to get a weighing scale!!! The weather here is really hot; thank God for air conditioners! I’m glad your day was pleasant and hope your week is also. =) And these look delicious; honey and chocolate? Or should I say chocolates…thanks for sharing! This week we have very pleasant weather. I enjoyed eating the cupcakes. When is Idd? I hope it’s somewhere around the corner. Thanks and have a very lovely day!!! I wish you all the best, at least you’re more than half-way through. I never give much thought to the moon, even when it’s full. Take care and thanks again for visiting and for having a long conversation with me. I truly appreciate! These look tasty! I would never survive without my washer, I just did 6 loads of wash a couple weekends ago and I still do plenty during the week! Luckily mine should be good for some time since we got a new one when our middle child was baby, a true necessity when cloth diapering! Enjoy the rest of the week. I remember cloth diapering 12 years ago..I used to do two loads every single day, so I understand what you’re talking about. 6 loads in your house is equivalent to two loads in the laundromat. Thanks so much for visiting and have a happy washing. Xoxo to the boys!!! Don’t worry. I have a list too, and it’s long. Very long. But somehow I shall make time and go through it. I have only checked off two recipes so far…I have to change my strategy for doing things, I think. Anyway thanks so much for being here and I wish you a great week and a pleasant day! You certainly have a better, workable strategy than mine for sure, at least you’ve gone through eight! I will be styling up soon, but I also have a huge backlog of posts…I have to double up my hours in a day. Thanks and enjoy the day! And taste amazing too. Thanks for visiting me. I wish you a very pleasant week!!! It’s a toss up about having one’s own laundry facilities and getting it all done at once. I’ve always enjoyed the opportunity to read uninterrupted. I vote for getting it all done at once, that gives me more time for doing other things. Thanks for visiting after such a long spell of silence. I shall be visiting you in a few minutes. Have a wonderful day!! !